Post updated January 10, 2019. People are often surprised to find out they can use the Capitol Corridor service to travel to San Francisco. Just imagine: not having to deal with traffic and pricey parking in a city notorious for both! Instead, you’ll relax on the train, enjoying spacious and comfortable seating, spectacular views, free Wi-Fi, and a Café Car stocked with light meals, snacks, and a variety of beverages, including wine, beer, and spirits. You’ll find that, unlike driving, riding the train becomes much more than just a way to get from point A to point B— it’s part of the day’s enjoyment! The Capitol Corridor offers three main ways to get to the City by the Bay. Here’s a rundown on each trip: how to do it, and where it can take you. Take the Capitol Corridor train to the Emeryville Station. There you’ll board a comfortable, Capitol Corridor-dedicated bus that takes you into San Francisco. The bus stops at the downtown Transbay Temporary Terminal at Main & Beale streets, and makes limited stops at Pier 39, the Financial District (weekdays only), and the SF Shopping Center on Market St. (weekends only). The beauty of this option is that you don’t have to worry about figuring out how to make your connection once you get off the train in Emeryville; when you book your trip, you get both your train ride and bus ride in one seamless transaction, on a single ticket. What’s more, since our bus service is dedicated to Capitol Corridor train riders, you can rest assured you won’t miss your connection, even if the train is late. The Transbay Temporary Terminal’s downtown location provides easy access to many of San Francisco’s popular restaurants, shopping, museums, and other attractions. You’re within short walking distance of Market Street, San Francisco’s main thoroughfare (which features easy, convenient transit connections to other parts of the city), and not much further are the Embarcadero and the Ferry Building, which holds a lively Farmer’s Market on Tuesdays, Thursdays, and Saturdays. From the Transbay Terminal you can also connect to San Francisco’s local bus network, Muni, or hail rideshare for travel to the further reaches of this big, bustling city. 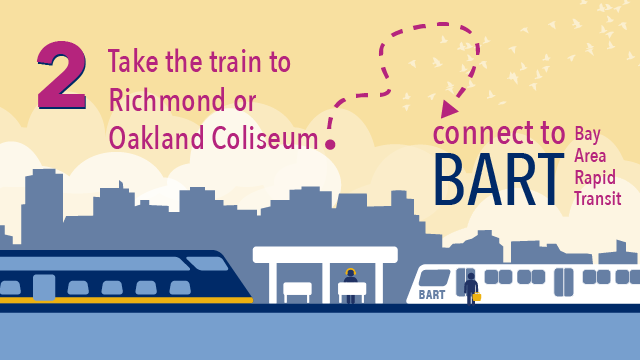 Depending on your station of origin, take the Capitol Corridor train to either Richmond or Oakland Coliseum, where you can easily connect to a Bay Area Rapid Transit (BART) train heading to San Francisco/Daly City or SFO (San Francisco Airport). BART has frequent service, with trains running every five to 20 minutes that will whisk you into the city in no time. Since BART is not part of the Capitol Corridor or Amtrak systems, Capitol Corridor riders must purchase a separate ticket for BART. BART tickets are sold at BART stations, but you can also pay your fare with a Clipper Card, which is sold in the Capitol Corridor Café Car with a pre-loaded value of $11— enough to get you to downtown San Francisco and back. (You may need to add more value to your Clipper card for trips beyond downtown San Francisco, such as San Francisco International Airport. The better question may be, where can’t you go? Connecting to BART is a definitely a good choice if you’re headed to the downtown area of San Francisco anywhere near Market Street. Get off at BART’s Embarcadero station for a short walk to the Ferry Building, Embarcadero Center, the California Street cable car, or Muni connections to AT&T Ballpark. For an afternoon in Chinatown or at the San Francisco Museum of Modern Art, Montgomery station is very close (as is the Powell station). Want to hop on the cable car to Ghiradelli Square? Get off at Powell, which is also a good starting point for the Westfield Shopping Center, Union Square, Yerba Buena Gardens, and the Moscone Center. And for many of the city’s theaters, as well as the War Memorial Opera House, Symphony Hall, Public Library, City Hall, and the Asian Art Museum, take BART to Civic Center. With this option, you’ll be traveling in style. This trip takes longer than the others, but if you’re not on a tight schedule, it’s a unique and pleasant way to get into the city, combining the comfort of our trains with the relaxing, refreshing, scenic experience of cruising on the San Francisco Bay. 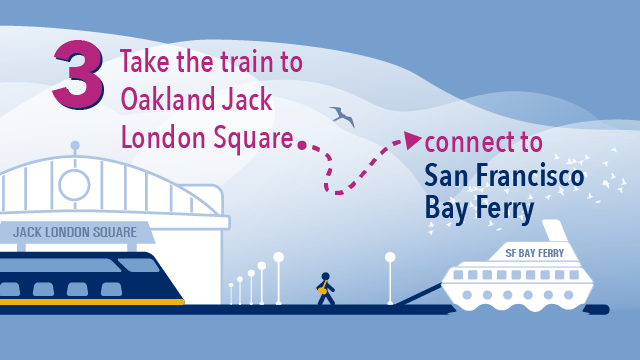 Take the train to Oakland Jack London Square, where you’ll connect with the San Francisco Bay Ferry. The ferry dock is an easy, roughly 10-minute walk from the train station through Jack London Square, a destination in itself, with excellent waterfront restaurants and live music venues. 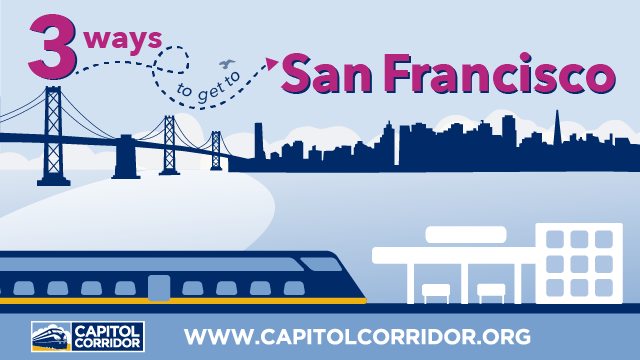 Like BART, the ferry is not part of the Capitol Corridor or Amtrak systems, so you’ll need to purchase your ticket separately and plan ahead for making your connection. The ferry from Jack London Square can take you to AT&T Park (during baseball season and for select events all year round), the San Francisco Ferry Building, San Francisco Pier 41, and South San Francisco.